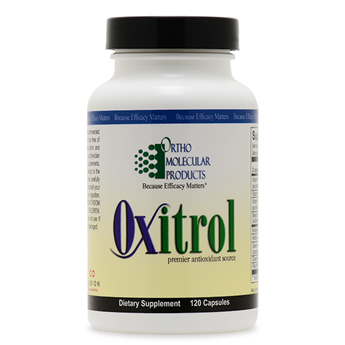 Sufficient amounts of antioxidants, like those found in Oxitrol, combat the advancement of cell-damaging free radicals while supporting the body's critical functions and immune defenses. The body is constantly producing free radicals from metabolic processes that occur on a daily basis. Free radicals are also formed as a result of environmental factors, including toxins in the food we eat and the air we breathe. Antioxidants are required to neutralize these free radicals in order to avoid oxidative stress that can impair cellular function. Antioxidants neutralize free radicals by donating an electron to a free radical. N-acetyl cysteine is known for being able to increase levels of glutathione, another powerful antioxidant, and alpha lipoic acid is well known for its ability to restore vitamins E and C and glutathione pools in the body. Oxitrol provides an added boost of antioxidant support by including these powerful antioxidants, plus phytonutrient antioxidants green tea, quercetin and red wine concentrate. Oxitrol was developed to provide the body with a broad spectrum of antioxidant support from a combination of vitamins and plant-based phytonutrients. By providing optimal amounts of antioxidants together in one formula, Oxitrol helps combat the advancement of free radicals while supporting the body’s critical functions and immune defenses.